Fig. 1. The Myrtle, vol. 34, no. 1 (3 May 1884), p. 6. Origins & Development. The year 1883 marked the 400th anniversary of the birth of Martin Luther (1483-1546), an event that would have raised interest in his life and works, including his hymns. The song “Away in a manger” seems to have been written for the occasion, then misleadingly attributed to Luther himself, even though this song is not to be found in any of Luther’s hymn collections, nor it is known to have existed in any form in the German language. The first known appearance of the song in print was in a Universalist publication, The Myrtle, vol. 34, no. 1 (3 May 1884 | HathiTrust), p. 6, with the claim “it is still sung by many German mothers to their little ones.” It also says, incorrectly, the 400th anniversary would be “next November.” This early printing contained two stanzas, mostly similar to the ones that have entered common use, except the second ends, “and stay by my crib watching my lullaby.” Notice also the recommended tune: “Home sweet home” (H.R. Bishop & J.H. Payne, 1823). 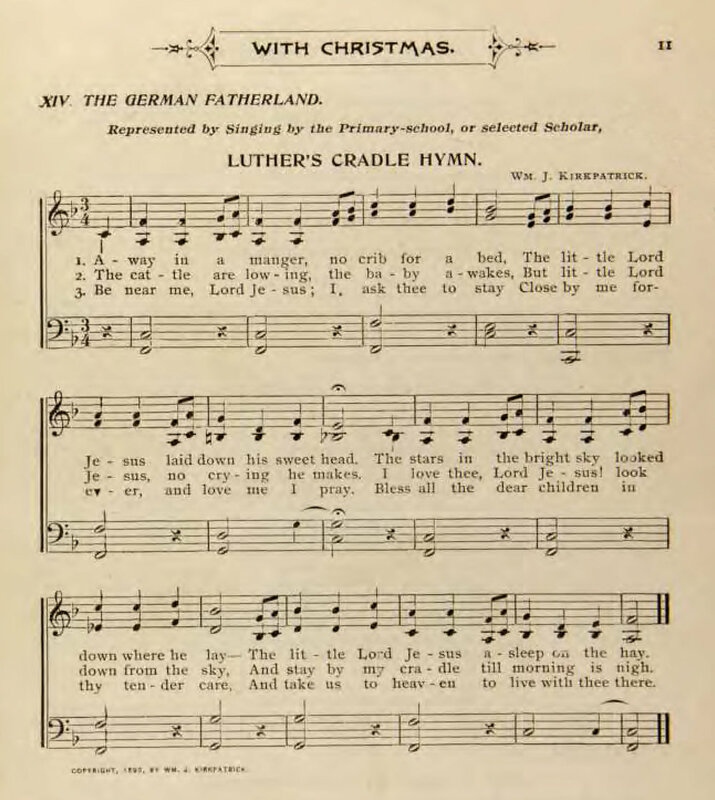 The first appearance of this song in a hymnal or songbook was in an Evangelical Lutheran collection, Little Children’s Book for Schools and Families (Philadelphia: J.C. File, 1885 | Fig. 2). This collection used the same text as in The Myrtle, but it was careful not to repeat the attribution to Luther. The tune, ST. KILDA by J.E. Clark, has not endured. Fig. 2. Little Children’s Book for Schools and Families (Philadelphia: J.C. File, 1885). The most commonly printed tune for this carol was published two years later in Dainty Songs for Little Lads and Lasses (New York: J. Church Co., 1887 | Fig. 3) by James R. Murray (1841–1905). Murray’s version uses the same two stanzas as the previous editions, except he changed the last line to the more awkward phrasing, “And stay my cradle to watch lullaby.” Murray repeated the claims given in The Myrtle, both to Luther and to German mothers. This tune was later dubbed MUELLER after it started to appear in 20th century collections inexplicably attributed to Carl Müller, and it is sometimes also known as AWAY IN A MANGER. Murray continued to develop his tune in other collections. 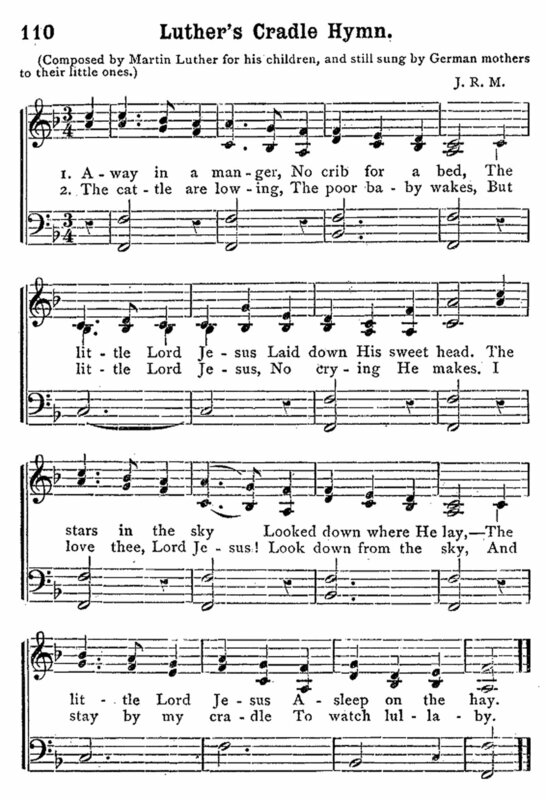 The following year, he used it in Royal Praise for the Sunday School (1888 | Hymnary.org) with a four-part harmonization, and he extended the tune by adding another musical phrase over a repeat of the last line of the text. Fig. 3. Dainty Songs for Little Lads and Lasses (New York: J. Church Co., 1887). 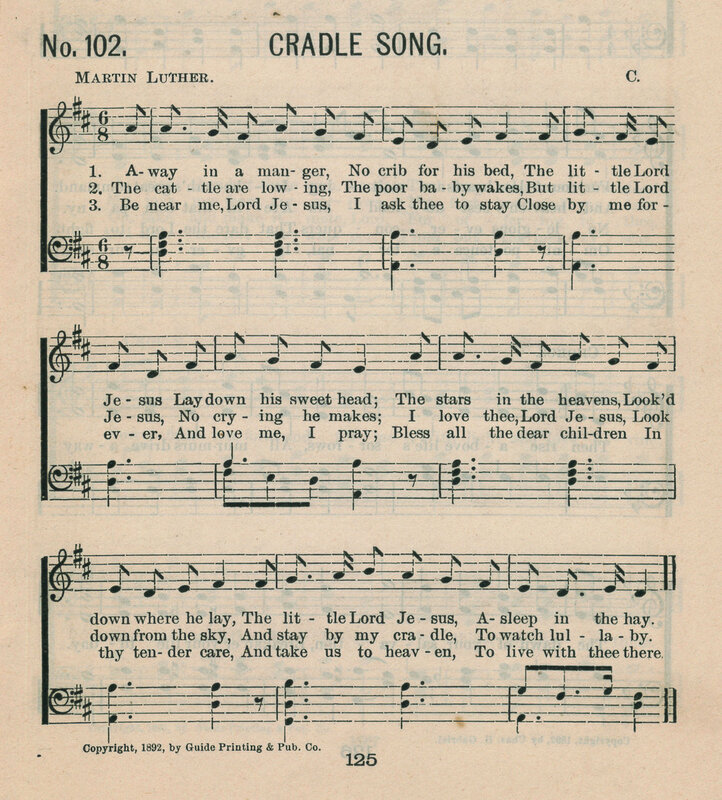 The third stanza, “Be near me, Lord Jesus,” first appeared in Gabriel's Vineyard Songs (Louisville: Guide Printing and Publishing Co., 1892 | Fig. 4), compiled by Charles H. Gabriel (1856–1932). Gabriel reused the text as given by Murray and added the third stanza without attribution. The musical attribution to “C.” is curious; Gabriel’s own work throughout this book was consistently labeled either “C.H.G.” or “Chas. H. Gabriel.” Nonetheless, this tune appeared a few years later in Edwin Excell’s Make His Praise Glorious (1900), No. 156 (Hymnary.org) with an added refrain and a notice of “Copyright 1896 Chas. H. Gabriel. E.O. Excell, owner” and the tune attributed to Gabriel. Gabriel wrote another tune for his collection Little Branches (Chicago: Meyer & Brother, 1893), No. 21 (Hymnary.org). Fig. 4. Gabriel's Vineyard Songs (Louisville: Guide Printing and Publishing Co., 1892). When I was Secretary of the Board of Education, 1904-08, I wanted to use “Away in a manger,” which I found with the designation “Martin Luther's Cradle Song,” in the Children’s Day program one year. It had but two stanzas, 1 and 2. Dr. John T. McFarland, then Secretary of our Board of Sunday Schools, was my near neighbor in his office at 150 Fifth Avenue (New York). I asked him to write a third stanza. He went to his office and within an hour brought me the third stanza beginning, “Be near me, Lord Jesus, I ask Thee to stay.” I used it, which was the first time it was ever published. I am pleased to see that it is now being used very widely. The honor of it belongs to that great and good man, Dr. John T. McFarland. The story is problematic on two levels: (1) Anderson was incorrect in asserting he was responsible for publishing the third stanza for the first time, and (2) he assumed McFarland had written it himself. McCutchan was also evidently unaware of the discrepancy. Fig. 5. Around the World with Christmas (NY: Hunt & Eaton, 1895). Richard S. Hill, “Not so far away in a manger: Forty one settings of an American carol,” Music Library Association, Notes, Second Series, vol. III, no. 1 (December 1945). “Away in a manger,” New Oxford Book of Carols, ed. Hugh Keyte & Andrew Parrott (Oxford: University Press, 1992), pp. 359-361. “Away in a manger,” Psalter Hymnal Handbook, ed. Emily Brink & Bert Pohlman (Grand Rapids: CRC, 1998), pp. 501-503. Carl P. Daw Jr. “Away in a manger,” Glory to God: A Companion (Louisville: Westminster John Knox, 2016), pp. 115-117.